Finally–the Bills Are Rolling In! For better or worse, it appears the spigot has opened at the Legislative Research Council (LRC), and the bills are starting to pour out at rapid speed. Today, January 25th, is the last day for unlimited bill and joint resolution introduction, and all bill drafts are due to the LRC by Monday. These deadlines always create a frenzy on the third floor, as legislators and lobbyists alike scramble to pitch their bills in order to maximize the number of co-sponsors at the top of the page. The LRC is notably short-staffed this year, and in their caucus presentations, they strongly encouraged legislators to file bill drafts early. In last week’s Legislative Update, we urged members and others to make contact with House Commerce & Energy Committee members on House Bill 1019, which would have required the state to pursue costs of litigation when the state or any of its subdivisions prevail in a civil suit. If passed, this bill would have created an incredible chilling effect on citizens’ or organizations’ right to pursue legal remedies when the state is a bad or careless actor. Additionally, it would have given the state an undue advantage in forcing settlements. On Wednesday, after full testimony, rebuttal, and questions, Commerce & Energy Committee Chair Tim Rounds moved to send the bill to House Judiciary Committee, where it clearly ought to have been assigned to begin with. Following a DRA Action Alert posted on Thursday morning and shared with numerous allied organizations, calls and emails began pouring in to members of House Judiciary. This morning, the committee voted unanimously to defeat the bill. Thank You To All Who Took Action! Your Calls & Emails Make a BIG Difference! Community Energy Development (CED) Committee Chair Rick Bell arrived in Pierre on Tuesday of this week to meet with our prime sponsor, Rep. David Johnson, as well as staff at the Governor’s Office of Economic Development (GOED), interested lobbyists, legislators, and others around our Commercial Property Assessed Clean Energy (C-PACE) bill. What he intended as a one-day trip turned into two, as Rep. Johnson handed him the bill draft and signature sheet and instructed him to get sign-ons from co-sponsors. With help from DRA’s lobbyist, Rick worked the floors and halls of both House and Senate, pitching the bill and getting legislators to sign their names. Representatives on board this year are prime sponsor Dave Johnson (R-Rapid City)*; Roger Chase (R-Huron); Caleb Finck (R-Tripp); Bob Glanzer (R-Huron); Jamie Smith (D-Sioux Falls); Steven McCleerey (D-Sisseton). Senate sponsors are prime sponsor Art Rusch (R-Vermillion)*; V.J. Smith (R-Brookings); Wayne Steinhauer (R-Hartford); Troy Heinert (D-Mission); Reynold Nesiba (D-Sioux Falls). You may recall that we brought the bill into House Commerce & Energy Committee last year with only one House and one Senate sponsor, so we are making notable progress on educating legislators and others about the potential of this program, as well as addressing the concerns raised in last year’s hearing. 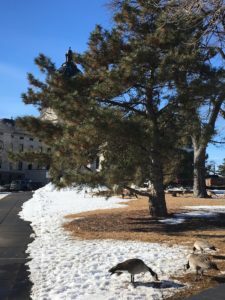 Future Legislative Updates, as well as other informational posts on our website (dakotarural.org) will provide members with updates on the program, this year’s bill number, and our progress at the Capitol. 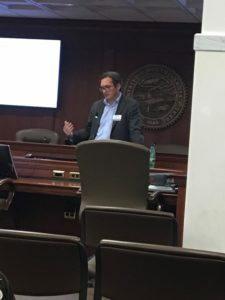 Dr. Matthew Elliot, Extension Agribusiness Specialist gave an hour-long presentation on the Ag Land Highest & Best Use Study on Wednesday afternoon of this week. The in-depth presentation is available in part on the Extension iGrow website. In South Dakota, ag land assessment for property tax purposes has used an agricultural productivity model since 2010. According to background information provided in the presentation, this “method is based off an income capitalization approach to appraisal.” However, in order for those appraisals to come out correctly, the input on Land Capability Class (LCC) and soils must be correct. Research has shown that in many cases, agricultural land in the state (and particularly West River) has been assessed incorrectly as cropland (LCC 1-3) rather than non-cropland (LCC 5-8), which inflates the value of the land for tax purposes. The study explores changes to assessments between the current method, which uses LCC, NRCS soil maps, crops rating, and forage use value; the “most probable use” method, which uses NRCS soil maps, probability of the land being cropped, crop rating, and forage use value; and the actual use method, which uses percent of cropland data, crop rating, and forage use value. The study found that, using the Most Probable Use method, that ag land assessments would rise in most East River counties by 1-11%, and ag land assessments in West River counties would fall from 9-65%. This research, along with the interim Ag Land Assessment Task Force, has brought us Senate Bill 4, which seems to move us closer to the Most Probable Use model. The bill has been assigned to Senate Taxation Committee, but has not yet been scheduled. Comments made during the informational presentation seemed to indicate that the bill may already have amendments in the works, and that other legislators may be planning to bring other bills on the subject. DRA’s lobbyist will continue to follow this issue and share information as it becomes available. DRA Citizen Lobby Days February 10th & 11th! We’ll be sending out a form to RSVP soon–but make sure to mark your calendars and make plans to join us in Pierre!